The workhorse of modern electronic circuits, both discrete and integrated, is the transistor. The importance of this versatile device stems from its ability to produce amplification, or gain, in a circuit. We ..say that amplification has been achieved when a .. circuits. As a means fOr creating gain. the transistor is in many ways analogous to a small valve in a large water system: By expending a small amount of energy (turning the valve), we arc able to control-s-increase or decrease-a large amount of energy (in the flow of a large quantity of water). When a device such as a transistor is used to create gain, we supply a small. signal to it and refer to that as the input: the large current or voltage variations that then occur at another point in the device are referred to as the output. The two most important kinds of transistors arc the bipolar junction type and the field-effect type. The bipolar junction transistor (BJT) is so named (N polor=-iwc polarities) because of its dependence on both holes and electrons as charge carriers. We will study the theory and applications of “bipolars” in this and the next chapter. and devote equal time to field-effect transistors (FETs), which. operate under completely different principles. in later chapters. . We should note that bipolars are studied first for historical reasons. and because the theory of these devices follows naturally from a study of PN junctions: Their precedence in our study should in no way infer that they are of greater importance than field-effect transistors. ‘Bipolars were the first kind of transistors to be widely used in electronics, and they are still an important segment of the semiconductor industry. Most people in ·the industry still use the word transistor (as we shall) with the understanding that a bipolar transistor is meant. However. field-effect technology has now evolved to the point where FETs are at least as important as bipolars. and arc. in fact; used in greater numbers than BJTs in integrated circuits for digital applications. A bipolar junction transistor is a specially constructed, three-terminal semiconductor device containing two PN junctions. It can be formed from a bar of material that has been doped in such a way that it changes from N to P and back to N, or from P to N and back to P. In either case, a junction is created at each of the: two boundaries where the material changes from one type to the other. Figure 4-1 shows the two ways that it is possible to alternate material types and thereby obtain two junctions. When a transistor is formed by sandwiching a single P region between two N regions, as shown in Figure 4-1(a), it is called an NPN type. Figure 4-1(b) shows the PNP type, containing a single N region between two P regions. In integrated circuits. the emitter is usually heavily doped (N+) material. Most integrated circuit BJTs arc of the NPN type are important for the transistor to be a useful device and to perform what is called normal “transistor action. For the sake of clarity, we will continue our discussion of transistor theory in terms of the NPN type only. The underlying theory is equally applicable to the PNP type and can be “translated” for PNPs simply by changing each carrier type mentioned in connection with NPNs and reversing each voltage polarity. 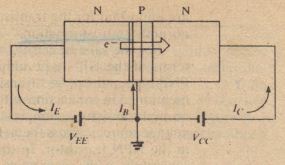 To obtain normal transistor action, it is necessary to bias both PN junctions by connecting de voltage sources across them. Figure 4-,3 illustrates the correct bias for each junction in the NPN transistor. In the figure, we show the result of biasing each junction separately. while in practice both junctions will be biased simultaneously by one external circuit, as will be described presently. As shown in Figure 4-3(a), the emitter-base junction is forward biased by the de source labeled Vr./,. Note that the Negative terminal of V”,: is connected to the N side of the Nl’ junction. as required for forward bias. Consequently, there is a substantial flow of diffusion current across the junction due to the flow of the majority carriers (electrons) from the N-type emitter. This action is exactly that which we discussed in connection with a forward-biased PN junction in Chapter 2. The depletion region at this junction is made narrow by the forward bias. as also described in Chapter 2. The width of the base region is exaggerated in the figure for purposes of clarity. W en the majority dectrons diffuse into the base. they ecome minorit carriers in that P-t e region. e say that minority carnerS11ave Qeen injected into the base. readily cross a reverse-biased junction under the influence of the electric field, and they constitute the flow of reverse current in the junction. Since the base region is very thin and is lightly doped (so there are relatively few holes in it), very few of the electrons injected into the base from the emitter recombine with holes. Instead, they diffuse to the reverse-biased base-collector junction and are swept across that junction under the influence of the electric field established by Vcc. Relll~ .mber again, that the electrons il’ ted into the base arc the .!! !i it carriers there and that minorit ‘ carriers readily c~ t e r biased junction. We conclude that electron flow conslltufes the dominant ctii’reht type in an NPR transistor. For a PNP transistor, in which everything is “opposite,” ho c t is the dominant type. Despite the fact that most of the electrons injected into the base ( lSS into the collector, a few of them do combine with holes in the base. For each .cctron that combines with a hol an ele eaves the base re ion via the base terminar.This action creates a very small base current, about ~ or ess of the electron current from emitter to collector. As we shall see, th ‘ ‘r this erccntage, the more lIseful the transistor is in practical applications. =- Note in Figure 4-4 that arrows arc drawn to indicate the ir ‘cli of conuenliol/( il current in the NPN tmnsistor. Of course, each arrow points in the OppOSI c dIrectIOn from the electron trows that we have describe Convention current flowing from Vce into the collector is called collector current and esignate (‘. Similarly, current into the base is I”. the base current, and current from VI:1: into the emitter is emitter current, /1:’ Figure 4-5(a) shows the standard electronic symbol for an NPN transistor, with these currents labeled alongside, Figure 4-5(b) shows the same block form of the NPN that we have shown earlier and is included as an aid for relating the physical device to the symbol. Figure 4-6 shows the standard symbol for a PNR transistor and its equivalent block form. Comparing Figures 4-5 and 4-6, we note first that the emitter of an NPN transistgr is represented by an arrow ponting out from th b se, whereas the emitter of a PNP transistor is shown as an arrow pointing into the base. 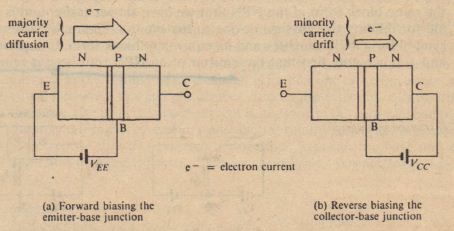 It is easy to remember this distinction by thinking of the arrow as pointing in the direction of conventional current flow, out of or into the emitter of each type of transistor. We further note that the polarities of the bias sources for the PNP transistor, VEt: and Vcc, are the opposite of those for the NPN transistor. In other words, the positive and negative terminals of each source in Figure 4-0′ arc the reverse of those in Figure 4-5. These polarities arc. of course. necessary ill’ each case \0 maintain the forward and reverse biasing of the junctions, as we have described. Note, for example, that the negative terminal of VI'( is connected to the P-type collector of the PNP transistor. Recapitulating, here is the all-important universal rule for biasing transistors for normal operation (memorize it l): The emitter-bose junction must he forward biased. base junction reverse biased. Recall from Chapter 2 that a small reverse current flows across a PN junction due to thermally generated minority carriers that arc propelled by the harrier potential. When the junction is reverse biased, this reverse current increases slightl . For moderate reverse-bias voltages, the rev. reac es I s satura Ion value Since the collector-base junction of a transistor is reverse biased, there is likewise a reverse current due to thermally generated carriers. Of course this “reverse” current. 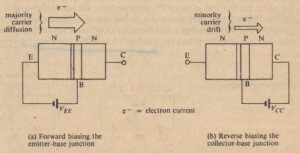 in the context of a transistor, is in the same direction as the main (collector) current flowing through the device due to the injection of minority carriers into the base. The total collector current is, therefore, the SIIIII of these two components: the injected minority carriers and the thermally generated minority carriers. fact, it is conventional in most texts and product literature to refer to lcso as the (coHector-to-base) leakage current. FinaU)” we should note that in some literature the (unfortunate) notation Ico is used to mean lceo. 1. l» == (0.5% of Ie·) = (0.008)(8.4 mA) = 67.2 ftA. 2. From equation 4-1, Ie = h – Is = 8.4 mA – 0.0672 mA = 8.3328 mA. 3. From equation 4-2, lell”‘}) = lc – lceo = 8.3328 X lO-JA – 10-7 A = 8.3327 mA. By equation 4-3, 0′. == IC(IN}/h = (8.3327 mA)/(8.4 mA) = 0.9919881. 4. By approximation 4-5, 0’. = lcl le = (8.3328 mA)/(gA mA) = 0.992.